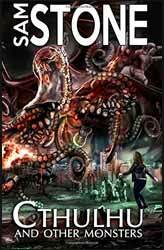 Cthulhu and Other Monsters is a short story collection written by female writer Sam Stone, author of around 15 novels and 2011 winner of the British Fantasy Society Award for Best Novel. This collection is split into two sections: the first nine stories are based around the mythos of H.P. Lovecraft’s Cthulhu and the Elder Gods, and the following seven feature various fantasy beasts. The book is published by Telos across 264 pages on good quality white paper. The front features cover artwork by Martin Baines. H.P. Lovecraft was a master of his craft. Not only an excellent fantasy/weird fiction writer but, in my opinion, one of the greatest writers ever. Having devoured his entire output several times my opinion has not changed. For this reason it is logical I would want to discover additional Cthulhu tales from other authors now that Lovecraft’s material is in the public domain. The problem is it’s almost impossible to emulate his characters and situations. He came from an earlier time, in terms of scribes. I have yet to come across any new storytelling tribute that has managed to capture his otherworldliness, feelings of frantic panic and madness, and descriptions of creatures which are both vivid and yet vague enough for your own imagination to heighten the tension (and that is clever, whether it was a conscious or sub-conscious process). Have I convinced anyone I like H.P. Lovecraft yet?! Although there is a constant fear a writer might be accused of plagiarism in these circumstances, the stories offered here in the first section very plainly steer clear of making the presence of Cthulhu or the Ancient Ones too obvious. There is only one close description of an octopus-like being, and none of the nine tales fit into a contemporary setting (or even an American Civil War one). The best of these is probably Fall Out, which involves an agreement with an ancient deity in exchange for good fortune. The Other Monsters stories work much better, unhindered as they are by a very talented writer and his creations. This section begins with classic monster scenarios, such as the sea as an entity and mermaids, werewolves, and a ghost which isn’t a ghost. But these are inventive to the extent that you wish for less clichéd myths. The Night Bird has an Island of Lost Souls feel to it. However, the most intriguing tale here is DNA Books; implanted books which can be accessed at any time and which place you in the action may sound like a good idea... until the book begins to assert itself over your own character.